I started photographing New York City in the snow during the Winter of 2009-2010 which was the same time that I started photography. 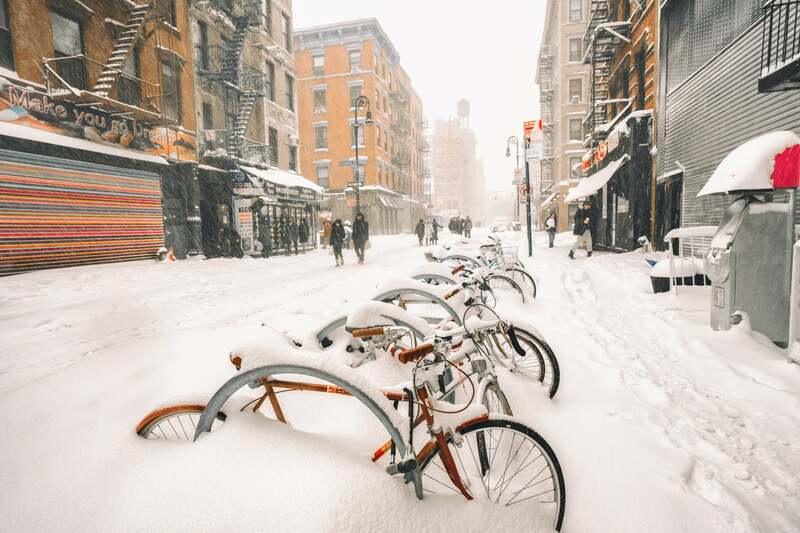 Having grown up in New York City, I have always been completely in love with how the snow transforms the city. The first storm I ever photographed was a blizzard and all I had was a broken point and shoot camera, very poor clothing for a blizzard (almost got frostbite! ), and a lot of determination. 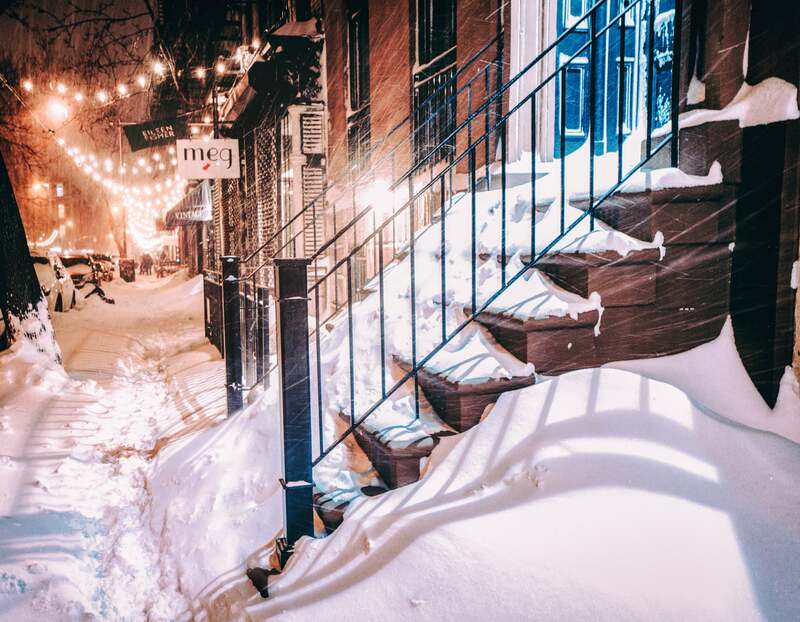 The photos I took during that first blizzard became some of my most popular photos and on some levels ignited my passion for photography and launched my career. 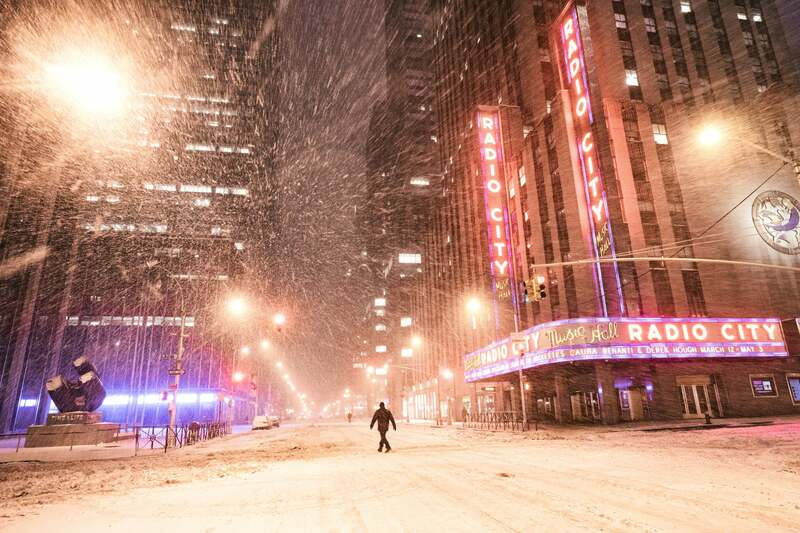 I have photographed every single snowstorm in New York City ever since that first blizzard. 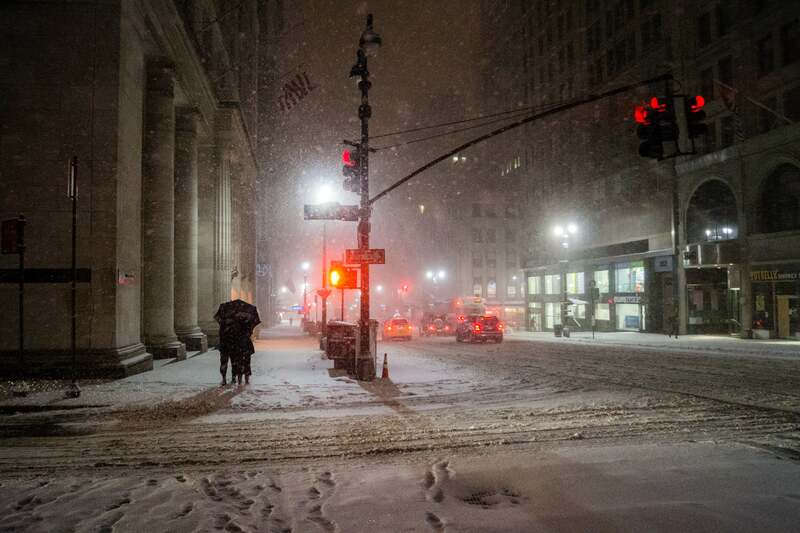 Every snowstorm is different in its intensity and in its emotional impact. My overall body of work (you can see more at my NY Through The Lens blog) is focused on exploring how certain scenes and tones evoke feelings of nostalgia and longing. Snowstorms, especially at night, are the pinnacle of these feelings and it's interesting to explore that through photography. 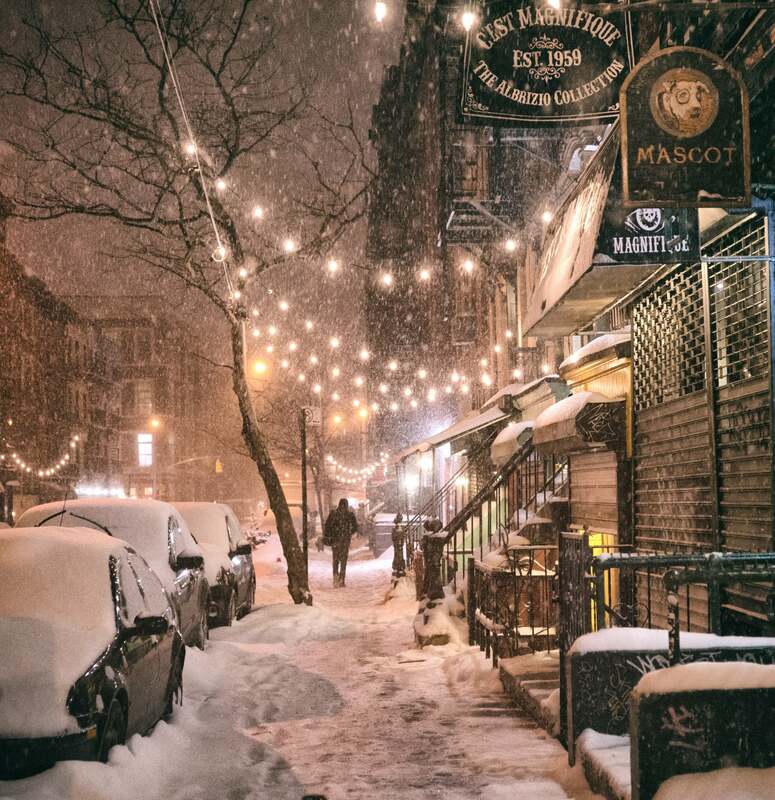 Photographing the snow in New York City is one of my biggest passions and I am proud to also announce that I am currently working on a book of my snow photography currently which will be released in stores worldwide in the next year. This is one of my most favorite blocks near where I live in Manhattan. 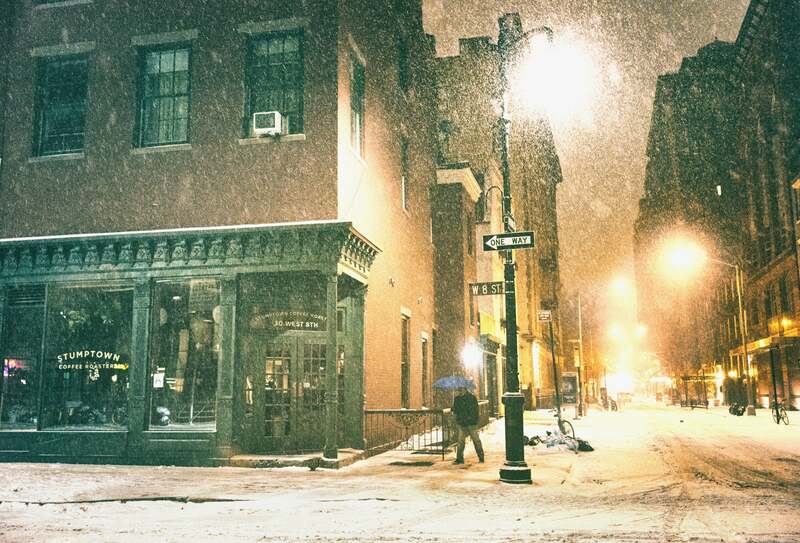 It's 9th Street in the East Village and at night during snowfall, it's one of the most nostalgic and evocative places. I wanted to capture the feeling of wonder when snow first falls and all of the memories it evokes. This has become a photo full of emotional meaning even more than the initial meaning I intended. It turns out that the sign in the photo is for a store that was in the owner's family for many years and the evening that I took this photo, the owner of the store passed away. His family saw my photo when I first posted it and we have maintained contact ever since since this photo has become special to them and makes them feel like his spirit was present there. This was taken during Winter Storm Juno in early 2015. It was a rare storm in that it was one of the first times in a long time that all vehicles were banned from the streets as well as all public transportation. I planted myself on the Upper West Side and walked around 7 miles in total all the way back to my home on the Lower East Side that night to capture the magic of a nearly empty New York City. This particular spot in Midtown is usually teeming with activity, but I had to wait nearly 20 minutes for a lone person to walk into the frame. On this night, it was a particularly harsh storm. The snow was heavy and the wind was whipping through the streets at around 55 miles per hour. I turned my back to the wind as the eerie silence of the city engulfed me. Something in me, an instinct or something akin to it, made me turn around for a split second with my face to the wind and snow. And in that moment a couple stopped on the next corner to embrace into the wind under the shelter of an umbrella for mere seconds. This is an part of Greenwich Village that I used to explore when I was younger. I grew up quite poor in Queens, and when I would visit Manhattan, I would often come to this area. In my mind, this was what all of Manhattan looked like at the time! I wanted to capture this place during a storm. I have always thought of it as a Hopper-esque street corner at night due to the architecture and the way the lights warm up a cold night. I often walk quite a bit in storms which is physically exhausting and demanding. In this case, I was at the beginning of my journey for the night. It was during a storm when the subway was open despite the fact that the storm was rather intense. 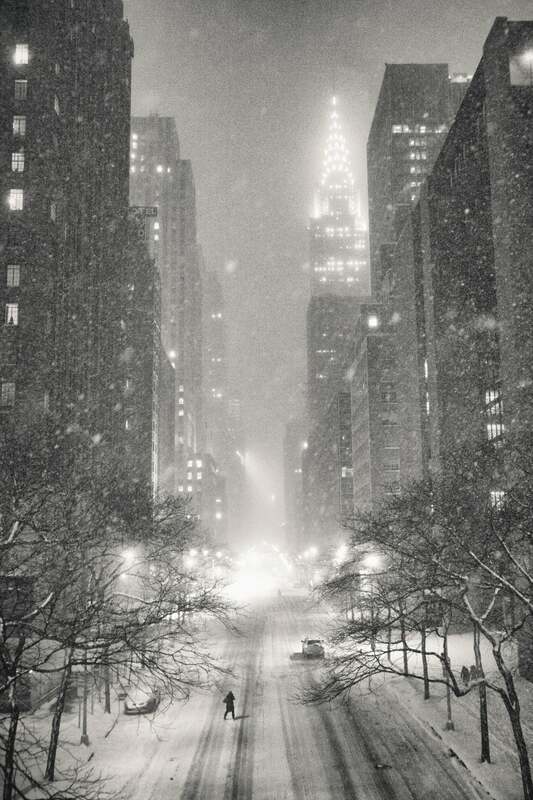 This view of the Chrysler Building from Tudor City is so iconic and I knew I wanted to capture a lone person walking across the street in the blowing snow to illustrate the vastness and scale of the surroundings. Snow is nostalgia personified. It's the feeling of wonder and magic that accompanies freshly fallen snow that makes photographing it so compelling. I took this photo nearing the tail-end of a really, really long walk around Manhattan. 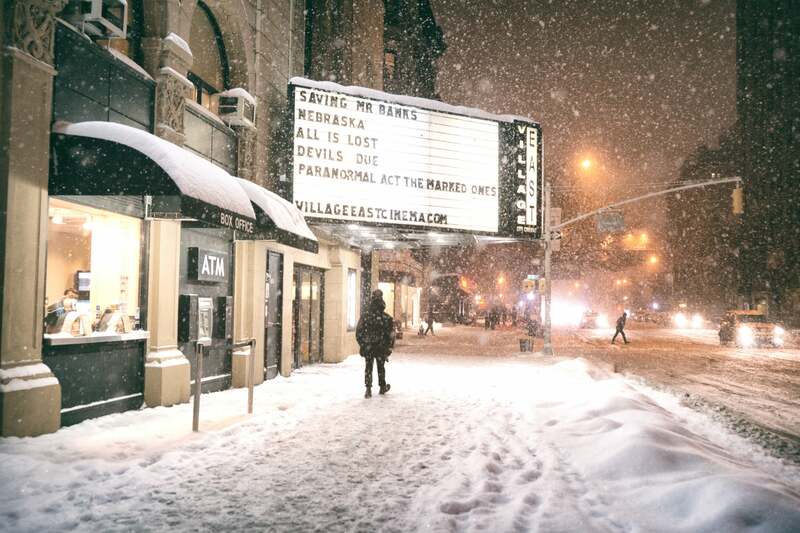 I was sore and exhausted, but I knew I wanted to capture the magic of how it feels to walk through the mounds of cloud-like snow under one of my favorite East Village marquees as people cross the street in the distance. I waited about 30 minutes to get the right combination of people to pass by in the scene. It was worth it. The recent storm dubbed Snowstorm Jonas and Blizzard 2016 was one of the most intense storms I have ever photographed. 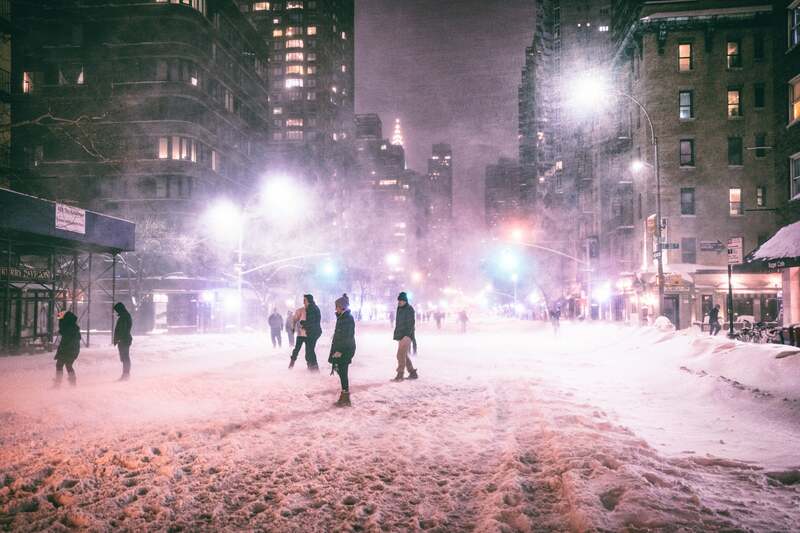 It produced 26 inches of snow in Manhattan alone and was the 2nd strongest snowstorm in NYC history. I went out two different times during the storm to photograph the snow and this was taken during the 2nd journey out. I was walking down the middle of 2nd Avenue since vehicles were once again banned from the streets, and a 50 mph wind gust blew mightily through the streets causing everyone to turn their backs to it. 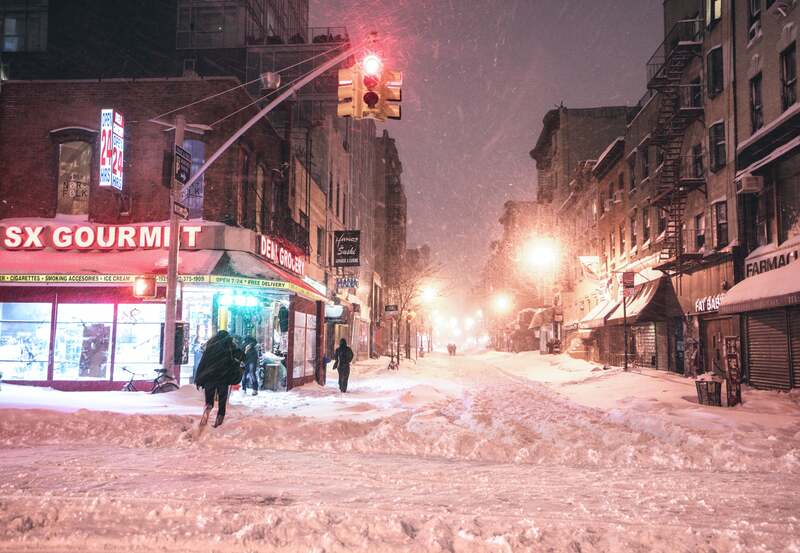 The first time I went out to take photos of Snowstorm Jonas, I stayed close to home in my neighborhood of the Lower East Side. I knew the storm was intense but I was still completely taken aback when I first ventured out. This photo was taken in the early afternoon and there were already snow-drifts that were hip-deep, enough to almost bury bicycles! This is one of my favorite scenes on Rivington Street because of the colorful street gate and the water-tower that is almost entirely made invisible by the deep snow-fog. This is a photo taken while waiting for a light on the corner of Essex and Rivington on the Lower East Side. I had just ventured out for the second time during the Blizzard of 2016 and I hadn't really even meant to take a photo of this corner. I see this scene every day so it's usually pretty mundane for me. However, the lights, the piled up snow, the sense of frenetic motion was just too good to pass up. If I am in the neighborhood, I almost always photograph this block. It's my happy place. In this case, I was in awe at the sheer amount of snow that was blanketing the stairs. I took this photo in Snowstorm Jonas while turning my back to the wind and waiting out the gusts. 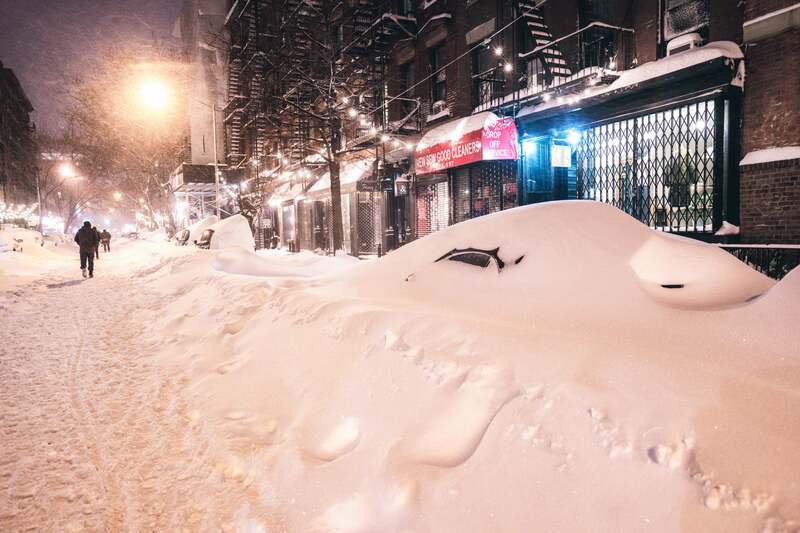 By this time of the evening, cars were almost completely buried on the Lower East Side and visibility was severely reduced. The snow was soft and the flakes were enormous. My current camera bodies (all Sony) do really well in snow and rain but since my lenses are not weather-sealed and I'm paranoid about ruining them I use a simple plastic bag (to be less eloquent, a bin bag - the thickest kind I can find usually clear). I take the bag, take one of the corners and snip the corner with scissors. I then put the bag over my lens with the snipped corner in the center of the lens. Then I stretch the bag over my lens with only the glass of the lens exposed. Next take the lens hood and put it on the lens with the bag stretched as detailed above. Sometimes I take a hair tie or rubber band and put it around the lens near the body. I use the hood as protection while I walk around for miles. I point the camera down between shots and blowing snow collects on the outside of the lens hood which is incredibly helpful. I shoot in manual mode always so since I mainly shoot these photos at night, I alter my settings every single block so I don't miss shots since I have to shoot very, very, very quickly due to the conditions. I try to not take a camera bag with me. It slows me down and is cumbersome. I am always trying to take the least amount of things with me while I shoot. I have quite a few pockets in my waterproof winter coat and so I usually have 2 or 3 Hand Warmers that I activate and put in an inner pocket with additional batteries to keep them nice and warm. I carry my camera (only 1 camera) around my neck and I leave the strap long so I can maneuver. And that's it really. I try to keep things extremely simple since I have the same philosophy when I do travel assignments for clients. I like to feel unencumbered and free to roam and I am constantly perfecting my minimal set-up. I have come a long way since 2009 in terms of the gear I wear while photographing snowstorms. For outer clothing I wear a waterproof, insulated, down-filled, knee-length parka and insulated, waterproof snowboard/ski pants with waterproof snow-boots. I wear a balaklava, ski-goggles, and have my hood up and drawn to my face to keep the blowing snow away from my head area. I have giant Thinsulate gloves that I wear with thin gloves underneath so that my skin is never exposed when I mess with my manual settings—which I do on every block. For inner clothing I usually wear Heat-Tech leggings, shirt, and socks with breathable thermals over the leggings. Something I have learned is that breathable/wicking fabrics are important. I walk up to 8 miles sometimes and even in sub-zero wind-chills, you can get too hot and you can actually sweat too much and get dehydrated. That sets off a myriad of bad issues leading to hypothermia. I am usually battling being too warm while out photographing and never really have issues with feeling too cold. In addition to her NY Through The Lens blog, you can follow Vivienne Gucwa on Instagram @travelinglens where she constantly posts new work.